The Tennant S9 sweeper is part of Tennant’s new “S Series of value priced sweepers launched in 2013. This unit was designed with maximum productivity and ease of use as the primary goals. With a 35” Cleaning Path the S9 offers the maximum productivity of any sweeper in its class. The S9 gets up to three hours of run time sweeping as much as 23,000 square feet per hour. This means that you can sweep about 69,000 square feet on a single charge. This productivity is about ten times faster than using a push broom. 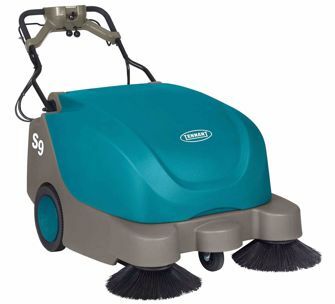 Labor savings achieved by using the S9 can easily be $400 - $500 per month in a facility that sweeps each day. Operators will love the S9 because it is so easy to use. The sweeper is self-propelled making work fast and easy. Controls are ergonomically designed and adjustable for proper fit. The on-board automatic charger and maintenance free batteries mean that you can just plug it in when you are done and forget it. You cannot overcharge the batteries and they never need maintenance. The process to empty the debris hopper is simple. This lightweight yet strong rotationally molded polyethylene hopper is on wheels allowing it to roll out for easy dumping. The large 2.2 cubic foot capacity hopper allows users to sweep longer without stopping to dump. Other maintenance to the S9 is very easy. Tools are not necessary for routine adjustments or maintenance. The Tennant S9 is ideal for warehouses, some manufacturing plants, and large outdoor areas. It will sweep far better than anyone can with a broom without creating a dust cloud.